When the twentieth century came to an end, curious mankind started to sum it up. This is what always happens when round figures show up on the historical calendar. 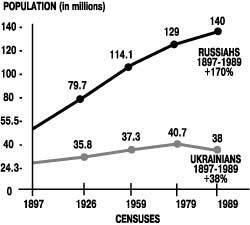 Let us also ponder over the quite natural question of the last centuries’ demographic effects on us, Ukrainians. The fact that our planet’s population is constantly growing is quite obvious: a living organism is supposed to grow and multiply. In 1960s, when I was at secondary school, they used to tell us at geography lessons that China’s population was soon to reach one billion. Today there art 1.3 billion Chinese. Other countries’ population statistics are less impressive, nevertheless being evidence of an active growth. However, the number of Ukrainians in the territory of the former Russian empire as well as the collapsed not so long ago Soviet Union has also grown during the last century. However, comparison is the mother of research. Data of the official censuses in the Russian Empire and Soviet Union can give us some idea of the rates of the demographic changes. We will compare data on Ukrainians and our Russian neighbors (See the diagram). The diagram was compiled basing on the officially published results of the Russian Empire and USSR’s censuses. All figures are rounded off to hundreds of thousands. Let’s start with the year 1897, last census in the Russian Empire. At that time 24.3 million considered themselves Ukrainians and 55.5 million — Russians. The Soviet power first became interested in statistics in 1926. The Russo-Japanese and First World Wars were over, as well as the atrocious civil war inspired by Bolsheviks (recall Lenin’s slogan, Let’s turn the imperialistic war into a civiwar! ), and the 1921-1922 famine. The New Economic Policy was soon to be replaced with Stalin’s “great turn.” Now there were 35.8 million Ukrainians and 79.7 million Russians. The growth of the Ukrainian population is still considerable, in spite of the changes in the state borders: in 1917 Finland and Poland became independent, with the latter’s east part inhabited mostly by Ukrainians. Another census took place in 1939, but its data were never published. Perhaps, the picture drawn by these figures was too dreadful. The next census was carried out in USSR only in 1959. Here we have an astonishing picture: the number of Ukrainians has grown only by 1.5 million in 33 years (with 27 of them belonging to the Stalin epoch). Now they were 37.3 million of them, while the Russians’ population in USSR increased to 114.1 million. Thus, the growth rate is, correspondingly, 4.1% and 56.9%. What a tragic correlation between this rate and 47.3% in 1926! Moreover, in the late 1930s — early 1940s Ukraine has received a considerable “injection” of population after annexing Halychyna, Zakarpattia, and Bukovyna — around six million. Now let’s look at the year 1970, when the Soviet authorities proclaimed that developed Socialism has been established. By that time there were 40,7 million Ukrainians and 129 million Russians in USSR. The tendency is quite clear: while before 1926 the growth rates of the Ukrainian and Russian populations were almost proportionate, even with Ukrainians in the lead, by 1970 the picture has changed dramatically. What is 3,4 million compared to 14.9 or 9.1% to 13.1% (speaking about the 1959-1970 dynamics)?